A number of Reliance Standard Life Insurance Company policyholders have filed denied disability lawsuits against their insurer claiming bad faith tactics. Reliance Standard, also known as First Reliance, allegedly practices bad faith insurance to delay, deny or terminate claims. If you have been wrongfully denied an insurance claim and think Reliance Insurance Company has conducted health insurance fraud, an insurance lawyer can help. Send your Reliance Standard Denied Disability claim to a lawyer who will review your claim at NO COST or obligation. Insurance for disability income protection provides financial benefits to employees when they are unable to work due to a disability caused by a covered illness or injury, regardless of whether or not that illness or injury is work-related. Reliance Standard Insurance offers both short-term disability (STD) and a full range of long term disability (LTD) policies. Reliance Standard has been selling insurance since 1906. The life insurance company is a member of Tokio Marine Group, a global insurance group incorporated in Japan and listed on the Tokyo Stock Exchange. On its website, the group emphasizes three “Good Company principles”, which are also shared with Reliance: “Look Beyond Proﬁt, Empower Our People, and Deliver On Commitments”, but denied disability claimants allege that Reliance has put profit before people and hasn’t delivered on commitments. Reliance offers LTD in all states, with the exception of New York, the District of Columbia, Puerto Rico, the U.S. Virgin Islands and Guam. In New York, LTD insurance products and services are offered by First Reliance Standard Life Insurance Company. First Reliance Standard policyholders have filed denied disability lawsuits—personal injury cases—against the insurance company claiming bad faith insurance practices. If you have had your claim denied, or if your claim was granted and then later terminated, you may be eligible for additional benefits. Insurer will send you to either be examined by a doctor of their choice (Independent Medical Examiner, or IME) who provides an IME Exam or a functional capacity exam (FCE) to evaluate your restrictions and limitations. The IME reports that you are not very limited and therefore not disabled. Insurer hires an IME to review your medical records—without seeing you--and their hired doctor reports that you are not disabled. Insurer hires a private investigator to video and photograph your daily “activities”. With photos and video surveillance footage it can argue that you can return to work. Insurer’s IME or nurse contacts your treating doctor and receives information that you can return to work. The definition of disability under your policy changes from “own occupation” to “any occupation” after 12, 24, or 36 months, and Insurer hires a vocational expert to find jobs other than your own that you could presumably perform on a daily basis. The circumstances for which the claim was made are not covered by the policy because of an exclusion or because it is the wrong type of policy.. The claim was poorly presented, so the insurance company wrongly decided that the claim was not covered. An insurance adjuster failed to review the evidence in good faith; the adjuster had already decided to deny the policy. The insurer wrongly decided not to extend important benefits that should have been provided by the policy, such as the duty to defend.. Along with offering STD and LTD policies as group plans to employers, which are subject to strict federal regulations known as the Employee Retirement Income Security Act (ERISA), Reliance Standard also offers certain voluntary group plans that may be exempt from ERISA. ERISA is a set of pro-insurance company regulations that tends to favor the insurance company rather than the claimant. However, ERISA insurance lawyers have experience in appealing and litigating ERISA claim denials. If Reliance Standard has denied your LTD, it is important that you take immediate action. The time period to submit an internal appeal with the insurance company is usually 180 days. After you have “exhausted” all of your appeals directly with the insurance company in an ERISA-governed claim, you may have limited time to file a lawsuit. Many Reliance Standard lawsuits stem from denial of legitimate Reliance long term disability insurance claims—where the insurance company allegedly unfairly and improperly fails to compensate the insured for a loss covered by their policy, or unreasonably delays making payments due under the policy. One case, Okuno v. Reliance Standard Life Insurance Company, was decided in 2016 by the United States Court of Appeals for the Sixth Circuit, where the claimant was denied LTD based on a pre-existing condition. The claimant was diagnosed with Crohn’s disease and other serious ailments and later developed depression related to her physical condition that rendered her unable to continue working. Reliance Standard denied her claim based on its disability insurance policy “Mental or Nervous Disorders” limitation: It limited disability benefits to a payable period of 12 months where the disability was “caused by or contributed to by mental or nervous disorders.” The policy also had a provision regarding “pre-existing conditions” that restricted benefits for a total disability “caused by,” “contributed to by,” or “resulting from” a pre-existing condition. But the claimant and her insurance attorney successfully argued in court that, “disabled by physical conditions alone, then the mere presence of a psychiatric component or condition does not justify application of the one-year limitation on benefits due to a mental health condition”. 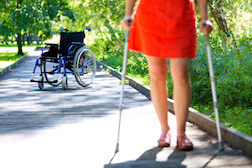 The lawsuit was filed in federal district court after the claimant’s initial denial and three appeals, which demonstrates the value of an experienced disability insurance benefits lawyer. In a 2017 wrongfully denied disabilities case, the claimant suffered Interstitial Lung Disease and required a bilateral lung transplant. First Reliance Standard initially approved and then denied LTD based on medical reviews by one of its in-house nurse case managers who had never seen the claimant, and disregarded the medical reports of the claimant’s treating physicians. In the appeal, ERISA attorneys submitted a Functional Capacity Evaluation from a well-respected therapist and letters from treating physicians, which resulted in First Reliance Standard reinstated his LTD and life waiver of premium claims. By being there for a short while, I start not feeling like myself, calling in sick and going to the doctor. That’s not normal for me as I normally don’t get sick. The doctor notice that something was wrong - you are stressed out? I explain about the new job how co-workers degrade you, having the customer think you are not doing your job; and putting themselves up high on the ladder like they are the only one know what they are doing and the only one doing the job, and talking and use profane language at you. Then my blood pressure started elevate and my doctor got alarmed and say if it does not go back down, you will be put on medication. So today, I got deny LTD because they stated that my condition is pre-existing. I was not stressful nor did I have high blood prior to this new stressful job hut in good health prior. I was told that my claim would be approved or disapproved within 90 days. I've had to fax or mail my records because Brittany, my claim officer, kept saying she wasn't receiving them. I ask her Aug 6th who would have the final say as to whether I received my benefits or not. She stated that would be her. Every time I question her about my case, I receive a letter a few days later stating my info has been sent for medical review. How many times does it have to be reviewed is my question but I never get an answer. I feel I'm being scammed and just being delayed intentionally. Any and all help with this company would be greatly appreciated.